The muscle as a single unit causes both hip extension and knee flexion. Both heads of the Biceps Femoris cause knee flexion. Only the long head of the biceps femoris, which originates in the pelvis — and therefore crosses the hip joint — causes hip extension. The long head of the bicep femoris is a weaker knee flexor when the hip is extended, and a weaker hip extender when the knee is flexed because of active insufficiency. Active insufficiency is the inability to produce maximal measurable tension (actively) because joint angles and levers put a muscle in a slackened position. The slackened position causes a less-than-optimal length-tension relationship of the muscle. Muscles generate less force when overstretched, as when origins and insertions are spread too far, or when the muscles are allowed too much slack, as when origins and insertions get too close. The length-tension relationship is measured from a percentage of 100% resting length of a muscle. The biceps femoris in exercise is an excellent example of active insufficiency, which explains one of the reasons leg curl strength can be stronger in a seated leg curl (hips in flexion) when compared to a prone leg curl on a flat bench (hips in extension). Consider also the effects of standing leg curl machines and prone leg curl machines with slightly flexed body boards. When the knee is semi flexed, the Biceps femoris has a tendency to rotate the leg slightly outward — external rotation. The external rotation can cause the feet to turn outward and seems to be a common sign of fatigue, visible by observing a walking gait. As part of the hamstring, the biceps femoris muscle provides stability to the back of the knee joint — helping to prevent shift of the femur forward over the tibia and helping to prevent strain of knee ligaments, such as the anterior cruciate ligament and the posterior cruciate ligament. Short head: The lateral lip of the linea aspera, between the adductor magnus and vastus lateralis, extending up almost as high as the insertion of the gluteus maximus; from the lateral prolongation of the linea aspera to within 5 cm. of the lateral condyle; and from the lateral intermuscular septum. Long head: The lower and inner impression on the back part of the ischial tuberosity, by a tendon common with the semitendinosus, and from the lower part of the sacrotuberous ligament. The insertion tendon splits by the fibular collateral ligament. 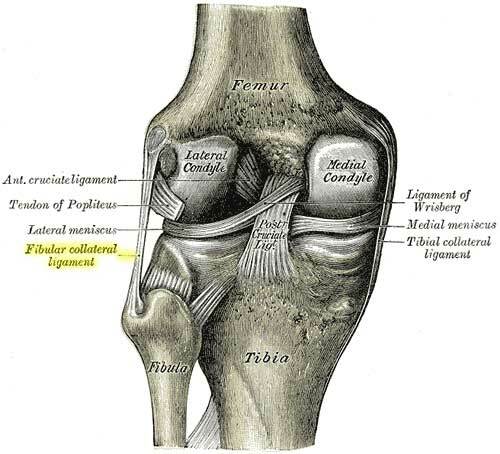 The Fibular Collateral Ligament is a strong, rounded, fibrous cord, attached from the back part of the lateral condyle of the femur, immediately above the groove for the tendon of the Popliteus down to the lateral side of the head of the fibula, in front of the styloid process. From the posterior border of the tendon a thin expansion connects to the fascia of the leg. 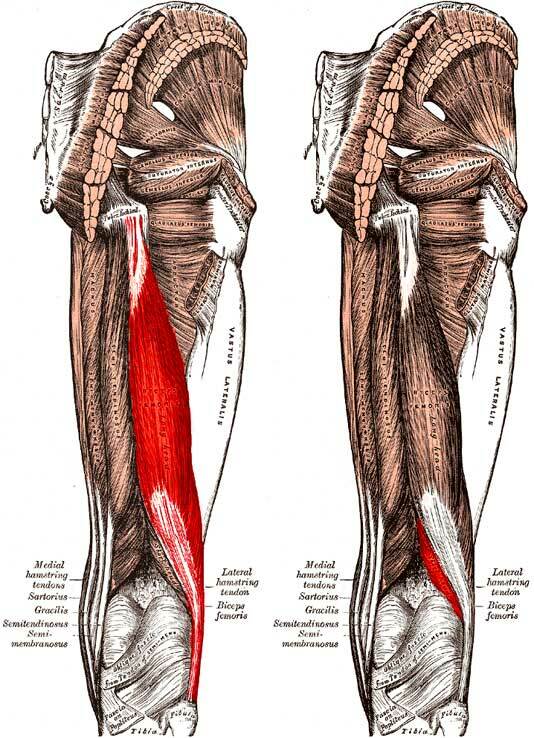 The insertion tendon of the biceps femoris defines the lateral hamstring. Posterior view of the left knee showing the head of the fibula and the proximal tibiofibular joint. The fibers of the long head form a fusiform belly, which passes obliquely downward and laterally across the sciatic nerve to end in an aponeurosis which covers the posterior surface of the muscle, and receives the fibers of the short head. The aponeurosis becomes gradually formed into a tendon, which is inserted into the lateral side of the head of the fibula. There is also a small slip into the lateral condyle of the tibia. Fusiform — fasciculi run parallel in same general longitudinal direction with narrowing at each end. Parallel designs allow excellent range of motion but are less powerful than multipennate. The short head of the biceps femoris can be absent; supernumerary heads may arise from the ischial tuberosity, the linea aspera, the medial supracondylar ridge of the femur, or from various other areas of the femur. A slip may pass to the gastrocnemius muscle. Quadriceps: rectus femoris, vastus medialis, vastus lateralis, and vastus intermedius. Knee flexion is a Third-Class Lever with the Biceps Femoris muscle producing the generated force input between the fulcrum (knee joint) at one end of the lever and the load (at the lower leg, ankle & foot) at the other end of the lever. Hip extension is also a Third-Class Lever when the leg is extended in open chain kinetics with the Biceps Femoris muscle producing the generated force input between the fulcrum (glenohumeral joint) at one end of the lever and the load (at the leg, ankle and feet) at the other end of the lever. Hip extension is also a Third-Class Lever when the hip is rotated posteriorly with the Biceps Femoris muscle producing the generated force input between the fulcrum (glenohumeral joint) at one end of the lever and the load (the upper body) at the other end of the lever. Important muscle in backside training. Glute-ham training in closed-kinetic hip extension is important in preventing hamstring injuries.